I need to keep the Sparkle Drive on this board! To make room, I'm going to experiment with a no-chorus setup for awhile. I've got a really pretty flanger sound dialed in from the Orbital, and I'm going to use that in lieu of chorus for awhile and see how it goes. I think you would love a Mobius. Yeah, I've lusted for those a bit, but they're just a bit too expensive for my comfort level at this point. Maybe someday. OK, the latest version. The Orbital made the cut, but not as a two-for-one replacement like I'd hoped. The Boss PH-3 has been kicked off, but the MXR Chorus remains. 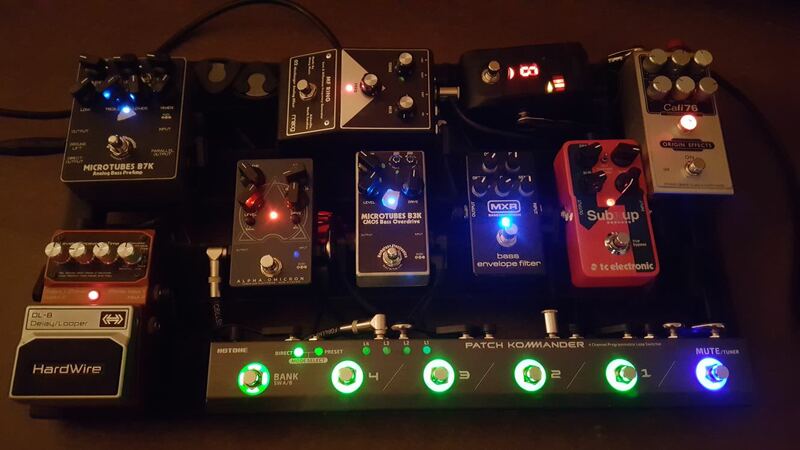 The Orbital is set up for Zero-Thru Flanger on the first switch and 12-Stage Phaser on the second. I also got my OC-2 back from the shop today, and I got the replacement power supply for the Compressore quite awhile ago. I'm now back and fully functional, just in time for my first gig of the year next weekend. RIP and XXL like this. Nachobassman, Bassist4Eris and RIP like this. OOoh boy, patch commander added...! Using the preset Omicron in combination with the B3k is so .... 0.O heavy? Nachobassman, DiMarco, Bassist4Eris and 2 others like this. What does the Photon Death Ray do? Hilarious name. XXL and PaulS like this. The Photon is an optical compressor, really a fantastic pedal with many great features. Are the foot switches on the patch commander soft switches? Have used it @ practice and in the studio....works like a charm, superby silent on the switches. I just added one of the new Grace Alix pres to my board. Set at 10meg ohm it really makes my upright NS design bass sing as well and my fully passive Dingwall. Its a lovely piece of kit. Nachobassman, Madmaskbass and Bassist4Eris like this. Are you selling your XP on TM this week? Have yet to hook it up, but this is the idea... Bring just the Transit B for jams, the rest for gigs where I need octaver, fuzz, wah and delay for some of the covers we do. Nachobassman, jcburn, jester and 1 other person like this. Comparing the fab five fat fuzz later on this weekend. Might do a vid. Also, green and chrome are a thing apparently. Did not do a vid but will post my findings in a separate thread. Maybe just add it to the existing thread "the gentle art of sounding filthy". Either way, here's my current board. We have a new fuzz champion. I added the Trace Elliot Transit B in the photo so you can see how small that machine really is. jester, Bassist4Eris and RIP like this. Nachobassman, jester, Bassist4Eris and 1 other person like this.